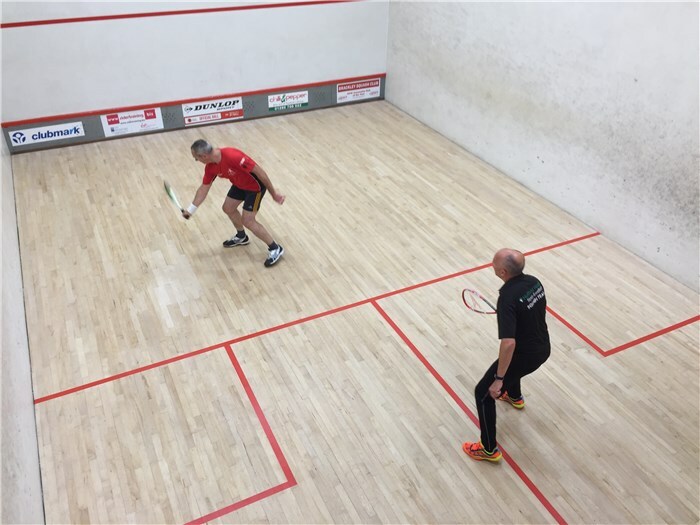 AWAY Tue 08 Jan v Abingdon 1st - We opened our inaugural season in the top division of the Oxon men’s league with an impressive 3-2 victory away to Abingdon 1. The match result was secured in the first 3 rubbers with George Lovatt, Hugh Perks and Lewis Milner all winning their matches (3-0, 3-0 and 3-1 respectively). With both Ashley Smith (1-3) and Tom Phipps (2-3) picking up valuable points in hard fought loses the final match score (16-7) which will hopefully be reflective of what may be in store this season. AWAY Tue 15 Jan v Carterton 1st - A second away match saw us travel to Carterton without #1 Tom Phipps, suggesting a difficult night could lie ahead. Proceedings started well with Jason Burgon (5) and Ashley Smith (4) both winning their matches 3-0 and 3-1 respectively. Carterton however then levelled things up in the next 2 matches. A hard fought defeat for Lewis Milner (1) 3-0 (11-13, 8-13, 11-13) was followed with a gut wrenching loss at #3 for Hugh Perks, who, despite managing to initially lead 2-0 then found the match slip away. With his opponent levelling by taking the third and 4th games. Hugh then lead 9-4 in the fifth but just couldn’t get the win his overall performance deserved, going down 2-3 (11-7, 15-13, 7-11, 3-11, 9-11). 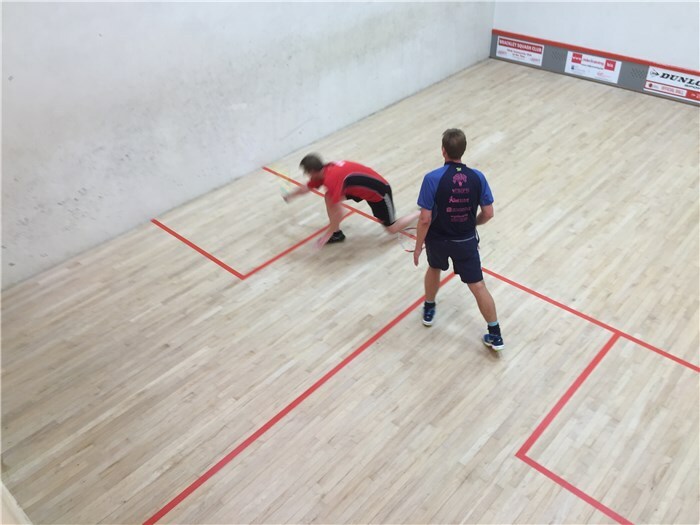 The deciding match of the night was between the #2’s with Cartertons Rich Green overcoming George Lovatt in a gritty and energy sapping encounter, George finally going down 1-3 (9-11, 11-9, 6-11, 8-11). Despite losing 3-2 (14-9) Brackley still find themselves in 4th place and can now look forward to their first ever home match in Oxfordshires elite league on Tuesday 22 January with the visit of last seasons champions Wallingford. HOME Tue 22 Jan v Wallingford 1st - A first ever home match in Oxon division one saw Brackley 1sts play host to the pre-Christmas divisional winners Wallingford. A club email and Facebook update saw approximately 30 spectators attend and absorb a thrilling match with a packed balcony over both courts and good old fashioned raucous home support getting behind the team. The fantastic support definitely made the difference with three matches ending in 3-2 home wins, a great all round team/club debut saw Brackley take the match 4-1 and continue what has been a fabulous start to the season. With wins for Jason Burgon (#5 3-0), Ashley Smith (#4 3-2), Hugh Perks (#3 3-2) and with the performance of the season thus far, Lewis Milner (#1, 3-2 coming back from 2-0 down) and a further point from George Lovatt (#2, 1-3) in the nights only defeat, Brackley took a huge scalp with a final 4-1 win (17-9). With an away trip to Caversham next week the 1st's next home fixture & Henley on Tuesday 5th Feb with what should be the strongest squash in the county from this seasons favourites for the divisional championship. If you want to see some of the best squash available please pop a long and get behind the team. With a result yet to be posted Brackley currently sit second in the table - an unbelievable feat for the club. AWAY Tue 29 Jan v Caversham 1st - After the euphoria of last weeks win it was down to earth with a bump following a 2-3 (7-14) away defeat to bottom of the table Caversham on Tuesday. With three players missing the firsts drew heavily on the seconds this week, damaging their chances also. The performance of the night was Thomas Phipps at #1 with exhibition stuff in the first 2 games and a dogged third seeing him to a 3-0 win. 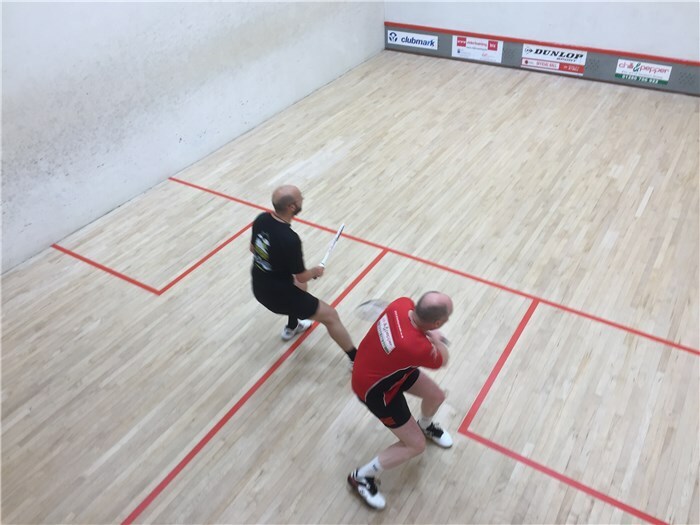 Another win for Jason Burgon (#3, 3-1) wasn’t quite enough as defeats for Wayne Dobbins (#5) 1-3, David Millard (#4, 0-3) and a night to forget for the in-form Hugh Perks (#2, 0-3) saw Brackley slump to a surprise defeat. HOME Tue 5 Feb v Henley 1st - Through commitments and injury we once again found ourselves defying the odds and taking a second major scalp of the season with a well earned 3-2 win. It could be contested that we actually never won the match but with Henley only bringing 4 players the conceded rubber was the difference on the night and kept Brackley in 2nd place heading in to what will be a first v second match at Racquets next week. Win’s for David Millard (3-0) and George Lovatt (3-0) we’re enough to give us a 3-2 (15-7) win with the other points coming from Lewis Milner (1-3) and Hugh Perks (1-3). AWAY Tue 5 Feb v Racquets 1st - We travelled to Thame for a top of the table clash with their hosts, Racquets. It was to be a surreal night with a first ever appearance from a touring professional in Brackley colours, current World Number 52, Ben Coleman - currently training ahead of his appearance in the World Championships later this month in Chicago. His appearance inspired what is the result of the season to date, a 5-0 (19-1) victory. This was without doubt the strongest side ever turned out and leaves us top of Division 1 with only one match of the first half of the season remaining. There was a clean sweep of wins for Ben Coleman (3-0 #1), Tom Phipps (3-0 #2), Lewis Milner (3-0 #3), Hugh Perks (3-0 #4) and Ashley Smith (3-0 #5). HOME Tue 19 Feb v Bicester 1st - Brackley 1st's proudly sit top of Oxon Division One going in to the home match with mid table Bicester. The home side saw Brackley debuts for Brazilian Diego Gobbi - PSA world ranked 162 - and Jordan Warne with a home debut for Tom Phipps - Jason Burgon and David Millard completing the line up. In front of yet another packed balcony the home side didn’t get off to a great start. David Millard lost a 5 setter 3-2 at #5 versus Mark Webster whilst Tom Phipps lost 3-1 at #3. Diego and Jordan then wowed those watching, both playing a high tempo attacking game and comfortably winning 3-0. With the match tied at 2-2 it was down to captain Jason Burgon to secure the win, another 3-0 at #4, Brackley taking the match 3-2 (16-6). The win sees Brackley remain top at the half way point in the season ahead of two consecutive home fixtures. HOME Tue 26 Feb v Abingdon 1st - In the 2nd of 3 consecutive home fixtures and the first match of the second half of the season, Brackley entertained Abingdon. It was only a four man team that travelled from Abingdon and the home side quickly despatched their weakened opponents 5-0 (19-1) #1. Jordan Warne 3-0, #2. Tom Phipps 3-0, #3. Lewis Milner 3-0, #4. Jason Burgon 3-1 and a walkover at #5. The result was amplified with the news that Henley had lost their match with Racquets and despite having them having a game in hand the Henley v Brackley tie on Tuesday 26 March could be a possible title decider! HOME Tue 5 March v Carterton 1st - This week saw a closely contested 3-2 victory over a very strong travelling Carterton team. 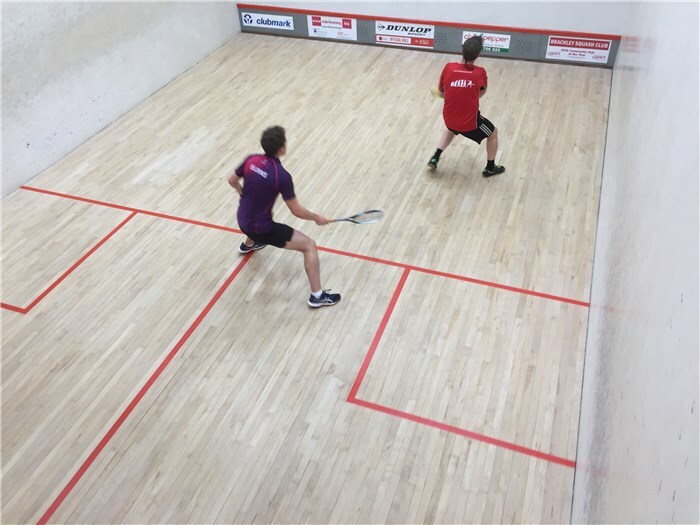 The match of the night had Diego Gobbi up against Adam Giles, with Adam playing some fantastic squash and taking the first game, a shock was palpable but Diego’s strength and quality came through over 40 minutes in an enthralling #1 string match - a 3-1 win for Brackley. 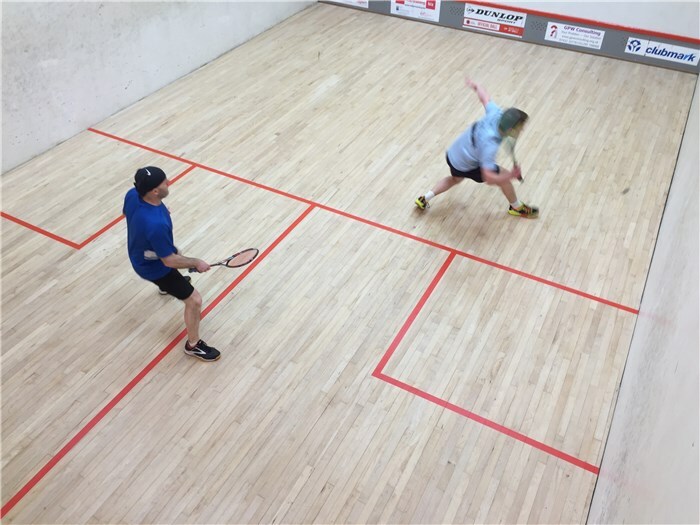 There were comfortable wins for Jason Burgon (3-0 #5) and Tom Phipps (3-0 #2), whilst High Perks (#4) had another gruelling 2-3 defeat at the hands of Calli Smith and Lewis Milner (#3) playing through injury picked up a point in a plucky 1-3 defeat. So good points from a 3-2 (16-7) and a 5th win on the bounce now. Having played a game more, Brackley still lead the division from Henley with that match looking likely to be a possible title decider when the teams meet their on 26 March! Further stats, result details, leagues etc can be found on the OSRA website, oxfordshire-squash.com.